I debated whether or not I was going to actually write about this, if I was really going to go there. But if we always skirt around icky conversations because we're afraid of taboo topics, how will we ever make positive progress? Progress in regards to toilets?!? Yup. I'm getting there. So today we'll be discussing poo, and when we're done here, I'll have given you the info you need to get yourself or someone you love the cleanest arse in town. Get ready to deal with it, friends! Or to stop dealing with it. Your arse, that is. The low down (expect puns galore in this post) here is that, unfortunately, many members of my family have "issues" when it's time to hit up the bathroom. It seems like many people I know and love simply dread dumpin'- but now, in this house, everything has changed! Check out the spraying device, located in the back of the seat. This is where the magic happens. 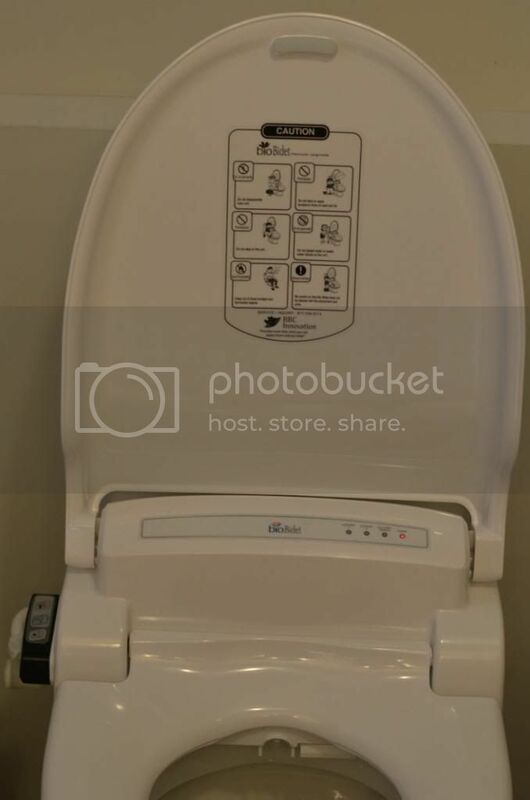 A family member, who had decided to take action against miserable pooping, advised us to take the plunge and get a Bio Bidet Supreme BB-1000, a "smart" toilet seat, designed to make your bathroom experience...more leisurely. And you know what? Ever since we've installed this queen of clean, my family members are seriously psyched for toilet time. *Please note that this is NOT a sponsored post. As always, I'm simply writing about something that our family digs. We ordered our system from bidetsPlus.com, because they had the best package deal, a travel bidet and 2 free carbon water filters included as a bonus. The package arrived in one week, and my husband had the entire seat installed, connected and ready to use within an hour. The only requirement is that you must have an outlet near your toilet, as the system plugs in for potty power. So what does this crazy toilet seat actually DO, you ask? What DOESN'T it do would be a more fitting question. Just getting warmed up- with your handy remote control, if you wish, you can opt to activate an internal heater so the toilet seat will be warm when you're ready for biz in the colder seasons. If you frequently hit up the bathroom at night, no more frosty seats. The grind of it is simple- you do your thang in there, and once you're done, you use your trusty remote to do the dirty work. 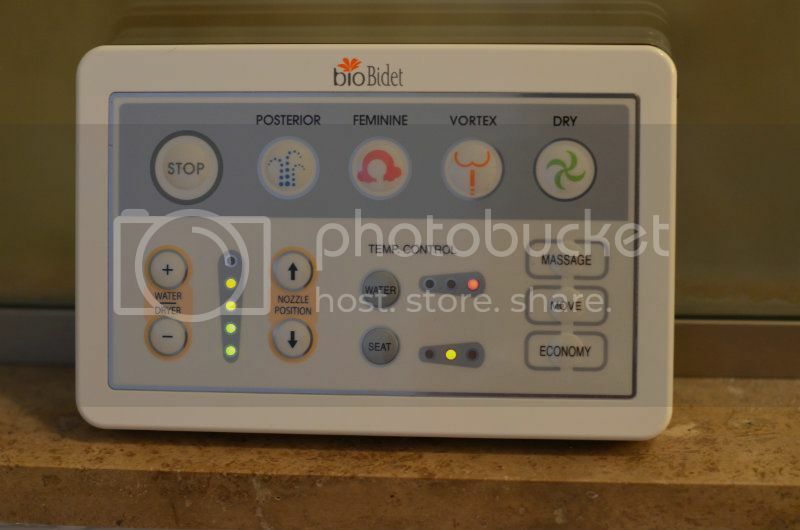 You can choose a "posterior" or "feminine" wash- where a stream of water (you control the temperature and pressure from the remote- and you can even set it to massage or pulsate if you wish) hoses down your nethers till you're clean as can be. And for those who are hurtin'- the "vortex" feature is intended to literally clean you out if you're having trouble in there or feeling backed up. The remote is very easy to use. My 4-year-old thinks it's the coolest thing ever. Once you're all spiffed up, hit the fan button for a warm drying blast from below. It's like sticking your hands under one of those dryers in a public restroom...only a lot more interesting. Living with stinkers? No problem. As soon as the seat detects pressure, it activates a built-in air deodorizer with a carbon filter, so the Bio Bidet is fighting funk at all costs. Down with stankin'! All in all, this thing is completely awesome. Who'd ever think it would be FUN to go to the bathroom? 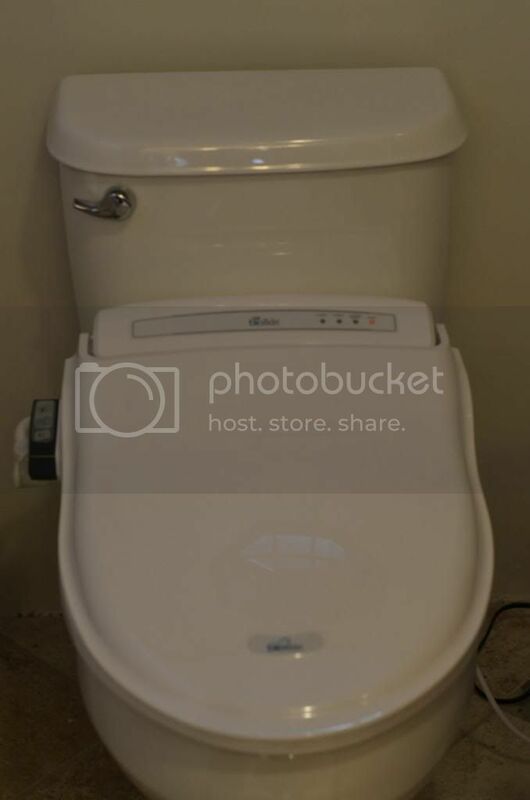 This fully loaded toilet (ok- now that's taking puns a little too far) is great for days when you have to skip a full body shower and still want to feel de-funk-ified. It's really just what you need if you're looking to add some luxury to "go time" at home. Gettin' duty done in style, three cheers for the Bio Bidet! If you know someone who'd be down to smarten up their commode before Christmas, Amazon Prime offers two day shipping on the BB-1000. You can grab one here for a last minute "blow your mind" gift. Make sure you know if the toilet is round or elongated and prepare to give up time with the recipient, since he/she will be giggling in the bathroom all day. Have a happy go time! Found any amazing new inventions that make your life a lil' easier? Tell us about them! Okay- now THAT is awesome!! I'm curious about this 'vortex' feature. It doesn't surprise or cause pain?? We talk poop all day long at our house. Once we get that wonderful abode of our own... this may be a serious first installment (especially if it eats up odors!!)... if I can get hubby to agree. I have not used the "vortex" feature myself, as I don't have personal need, but those I know who have used this feature report very smooth sailing, no discomfort. In fact, they say it's quite relieving and refreshing if you're backed up. The system would be rather easy to transport to a new home. You'd just remove it and bring it along to your next place. Like I said, all you need is an outlet near the toilet and to determine if you need a round or elongated shape. My family member accidentally ordered an elongated shape when they had a round bowl, and they use it without difficulty. It's just a bit longer than their bowl.